As the last Millennium ended, a list was composed for the most influential people of the preceding thousand years. Steven Spielberg came in at 91st. His standing on this erudite cultural ladder is all the more striking when we’re reminded his art form, his modality, that fluttering image we call cinema, was barely a hundred years old. In one tenth of the thousand years of cultural waxing and waning, Steven Spielberg has affected more lives, preoccupied more imaginations, than did hosts of genius politicians, knaves, philosophers, scientists and visionaries. 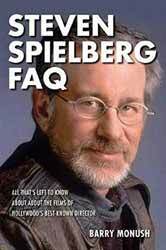 Steven Spielberg FAQ, by encyclopedic cinema historian Barry Monush, is a Herculean attempt to sum up this body of work whose facets alone loom larger than the lifetime product of most other filmmakers. Spielberg is a director, producer, writer, cinematographer, editor, musicologist and studio mogul. Sometimes he even ‘acts’. Usually as himself. Even his indirect contact in the role of producer bestows an unmistakable auteur’s touch. Monush’s book tries to capture it all and in many ways succeeds. This is a catalogue of who, what, when, where and how over fifty years - of not mere success in films - but triumph. This reader would have preferred some additional details of Spielberg the director though. There is a raft of anecdotes and plans to be sure and Spielberg the collaborator is referenced often, almost page by page, but his theory, policy and practice of team building is vague. Clearly he is a bonding agent for many talents but his observations on leadership and creative midwifery are absent. To Monush’s credit the subject of creative differences is touched when treating the famous case of Tobe Hooper on Poltergeist. Spielberg’s generous summation is explained as his own need to care for his creation with his own hands-on approach. He also notes that Hooper worked with him again on television productions. Cary Grant once told Motion Picture Academy members on an Oscar night, "It’s a collaborative art." No one in the business has inducted, led and infused such an army of talent as has Spielberg. His sense and sensitivity commend his own talent but also the talent of the choices he makes. Whether unknowns or superstars, intellects or rock icons, children or adults his track record in choosing team participants is, I think, an underrated talent in general and in this book in particular. Would that Monush added another typology to his chapter list (origins and sources; locations, where he shot each of his films; scripted by Spielberg himself; Spielberg the producer; and the sound of Spielberg: the musicologist) and shown us Spielberg the cineaste, curator of talent and connector of artistic energy. We know this aspect exists because the artist himself tells us and is very sharing with credit. Monush could have mined this vein in the lode instead of occasionally referencing it. His subject is a monster shark when it comes to film knowledge, devouring all things in movie lore since childhood. Random examples: a minor pinpoint illustrates this when wunderkind Spielberg’s breakthrough telefilm Duel includes Cary Loftin as the demonic truck driver, Loftin known as ‘arguably Hollywood’s greatest stunt driver ever’ (IMDb) but also a supporting role for Dale Van Sickel, Republic Serial master craftsman in stunts and acting (usually villains). These inclusions for the young Spielberg should be no more surprising than his grateful thanks to the legendary Andrzej Wajda (Schindler’s List) or collaborating with exemplary historian Doris Kearns Goodwin on Lincoln. The point? What Steven Spielberg sees in a movie tells us more about his cinematic soul than a mile of discursive description. What I’m waiting for, I guess, is the book: Spielberg on Spielberg (are you listening, Barry Monush and Applause Theatre & Cinema Books?) Until then, this must-read volume is my worthy pilot fish. It will not disappoint, only make you want more. But then, making you want more is the name of the game, isn’t it? How many times have you seen Indiana Jones?